SDMI dba Caribbean GeoTextiles Hurricane Storm Protection Breakwaters are offshore manufactured structures constructed parallel to the shoreline as part of a shoreline mechanism that helps to decrease the effects of wave action, which helps to reduce erosion throughout the Caribbean region. 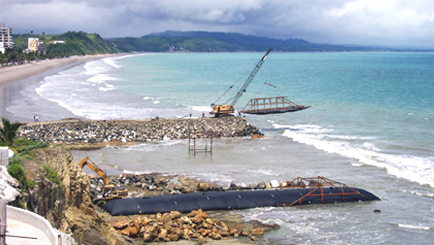 Additionally, GeoTextile environmental breakwaters can enable safer harbors by using the environmental breakwaters to create or expand a protected anchorage with reduced effects from weather and wave action. 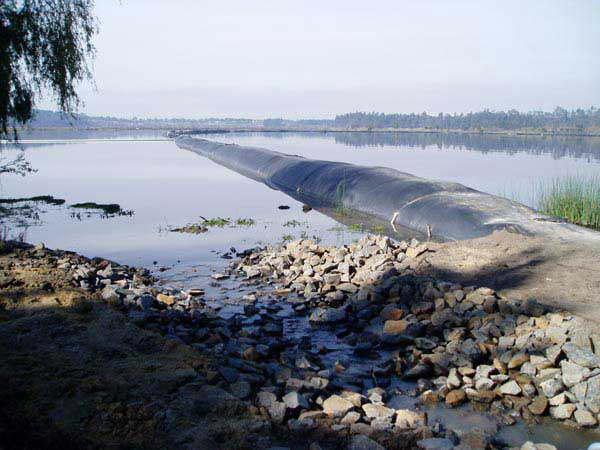 A GeoTextile Tube heavily armored with stone, articulated concrete mats or other products add further strength to the Geotextile additional protection. * Caribbean GeoTextile Tubes' Bags can be used as Hurricane Storm Protection environmental artificial reefs as well as breakwaters. This artificial reef bag will encourage plant or fish propagation. Usage recommended for countries such as Trinidad, Tobago, Aruba, Turks and Caicos, Bahamas, Virgin Islands, Cayman Islands, Puerto Rico, Costa Rica, Belize, Nicaragua and Honduras.